We’ve done it! The pilgrimage has been completed. 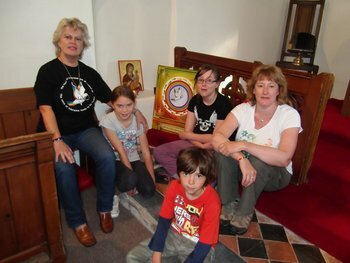 On Sunday 22nd July, our main pilgrim Ruth Davies, along with fellow pilgrims, arrived at St Rhidian & St Illtyd’s Church Llanrhidian in time for our service of thanksgiving and prayers for world peace which started at 4pm. The weather was perfect and the sunshine brilliant. What a contrast to the day when we started the pilgrimage with driving rain and dreadful driving conditions … especially for those who had to travel far to be with us. The last day was amazing. I think everyone was overwhelmed with what happened in St Rhidian’s & St Illtyd’s, and there are so many stories to share of what has taken place over the five days, much of it unexpected and wonderful. 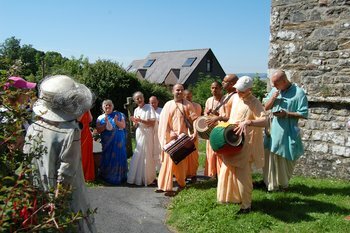 The most wonderful group of devotees from the International Society for Krishna Consciousness, along with His Grace Tarakanatha Das and Misrani Devi Dasi, arrived to share ‘Kirtan’ with our pilgrims and others as they arrived at the church. This was a beautiful welcome and joyful blessing for everyone. The whole area resounded with their bells, drums and chanting of the Maha Mantra. ISKCON also shared Kirtan within the church as they entered along with clergy, faith representatives and pilgrims. They had never been invited to do this before. At one point, the electricity in the village was suddenly cut and apart from the altar candles, we were all plunged into darkness. Our immediate thoughts were that we would be without the organ or the recorded music we had chosen for the service. Then, miraculously, the lights came back on at the very moment we needed our music! Lama Rabsang and sangha members of Palpung Buddhist Centre in Brynmawr shared Tibetan Buddhist mantras of peace and blessing. Sheikh Hassan, Imam from Swansea University Mosque, stood in the sanctuary and recited passages of peace from the Holy Qur’an. Tarrick El Hosaini stood at his side and gave the English translation. Norma Glass MBE from the Orthodox Jewish Community of Swansea shared Psalm 23 in Hebrew and the congregation followed by singing the much loved English version of the psalm, ‘The Lord’s My Shepherd’. 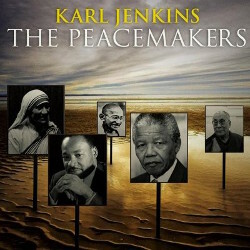 His Grace, Tarakanatha Das read the Hindu Vedic prayer of peace and Ruth S Davies read the peace prayer from the Tribal and Native Tradition. 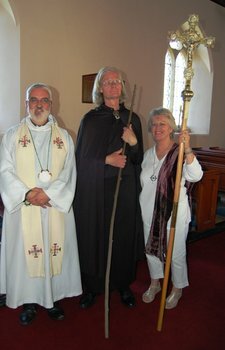 Thomas Corum Caldas, Ogham Master and Historian of the Ancient Order of Irish Druids, read out the pilgrimage prayer in Irish Gaelic to accompany the light of Saint Brighid. Ruth, our main pilgrim, read the prayer in Cymraeg to accompany the blessed light from Saint David’s Shrine and I read it in English to accompany the World Peace Flame. All three blessed flames were placed on the High Altar. Much incense was lit by Fr Andrew Pearce of St Teilo’s Church Bishopston and many candles were lit, including our pilgrimage peace votive. Peace votives were also lit by everyone present and all were placed on the altar as ‘Healing Light: a Celtic prayer’ from Karl Jenkins’, ‘The Peace Makers’ was played. 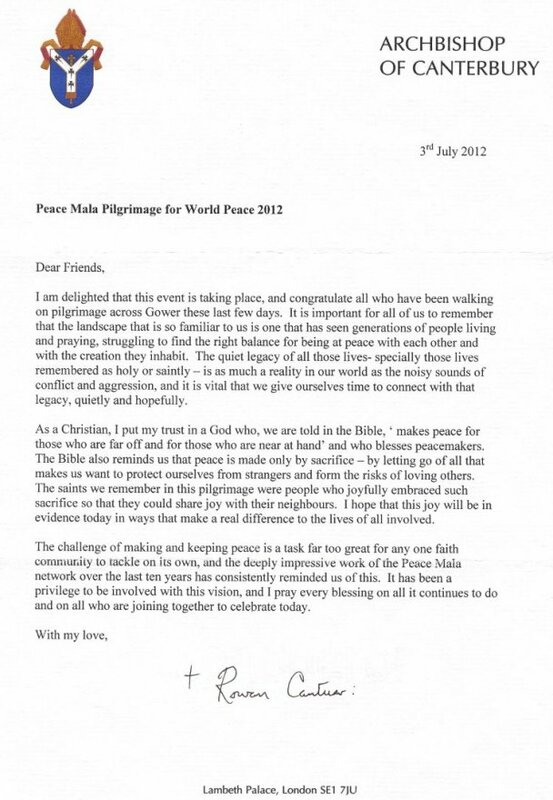 A special message from Karl, who was travelling in Italy at the time, was read out by Fr Tim Ardouin. And flourish Until it embraces the world. May we know the harmony of peace. 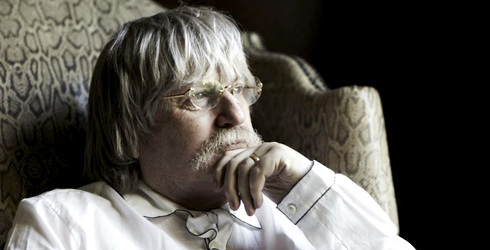 Dr. Karl Jenkins CBE B.Mus., F.R.A.M., L.R.A.M. 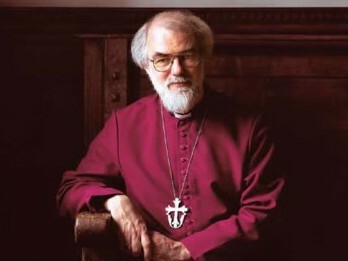 A message from Dr Rowan Williams, Archbishop of Canterbury, who had so much wanted to be with us but was in the diocese of Gloucester for the weekend, was also read out. Later in the service everyone shared the exchange of peace in different languages and from many traditions, in front the altar and throughout the church: Peace, Shalom, Salaam, Shanti, and Tangnefydd. What we have achieved over the five days of the pilgrimage has been incredible. From the unexpected pilgrims who joined Ruth along the way, the children of Knelston School who collected pilgrim cockle shells on Oxwich beach and walked and sang songs with Ruth and Revd. Hilary to St Illtyd’s, the warm greetings from church members who sometimes rang the church bell as we entered, to the singing of Welsh folk songs on Rhossili Bay and what happened at the end in Llanrhidian … all was beyond our expectations. I have been asked if we will do this again next year. I would hope so. The first person to ask that question was Jonathan, the Dean of Saint David’s Cathedral, when we collected the blessed light from the shrine on the 10th of May. We now have the pilgrimage in place and there are ways of planning it that will make next time easier. We could, for instance, have a different pilgrim ‘leader’ for each of the five days of walking. 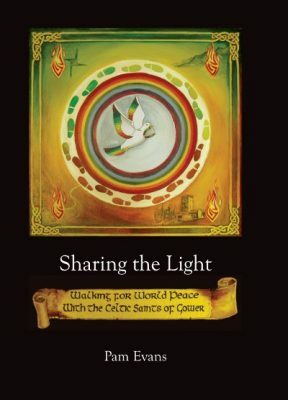 Others could join along the way and share in the lighting of the peace votives. 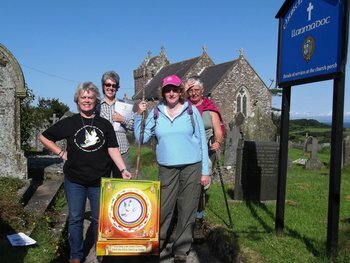 Thank you to Ruth Davies, our brave pilgrim, who came up with the idea of the pilgrimage in the first place and bravely walked for five days in the steps of the saints and lit all the peace votives across Gower. A special thank you must go to Fr Tim Ardouin for having the courage to follow my ideas of Peace Mala inclusivity and allowing what happened in his church on Sunday 22nd July. Thanks also to Fr Andrew Pearce of St Teilo’s Bishopston for his enthusiastic support and the imaginative idea that all clergy should relight all the peace votives lit in their churches again on the last day of the pilgrimage during Sunday morning Eucharist, thereby joining up all the lights in the churches across Gower. The lights were also lit by the vicars of Saint David’s Penllergaer and Saint David’s Morriston. His Grace Tarakanatha Das also took one back to the ISKCON temple in Swansea to include in their evening devotion. 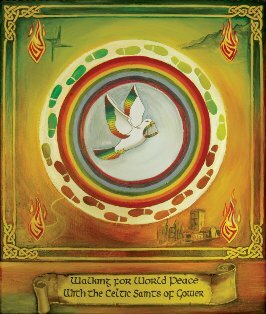 Thank you to Cannon Peter Williams who gave such lovely prayers for Peace Mala and the pilgrimage at St Madoc’s during morning Eucharist on the last day. Thanks also to Revd Hilary for the lovely welcoming services she organised for the receiving of our pilgrim(s) and the peace votives in the South Gower churches. Thank you to Archbishop Barry Morgan for his support and to Bishop John who travelled all the way from Brecon in driving rain to be with us on the first day. 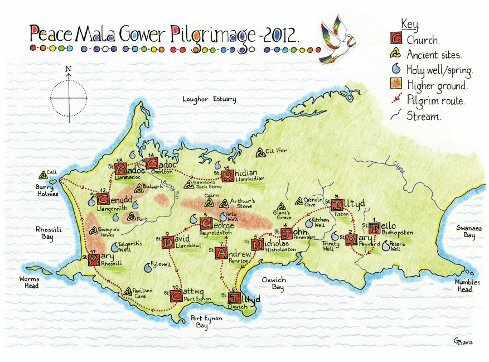 Thank you to all the clergy of the Gower Deanery. 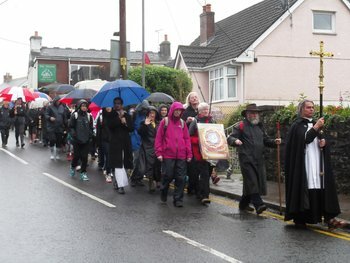 Without your support the pilgrimage could not have happened in the way it did. I also wish to thank Father Luke Holden of the Greek Orthodox Church for his support, the ministers of non-conformist churches who took part and Lama Khemsar Rinpoche of the Tibetan Yungdrung Bon Study Centre who took time out of his busy schedule to join us with Bishop John for the blessing of the pilgrimage and the peace votives on the first day at The Lamplighter Bishopston. Thank you to the members of faith communities who gave their valued support. They have been loyal to Peace Mala over the last ten years. They know that I respect them and appreciate their support and generosity in sharing the vision of Peace Mala. I know they will come again to support our important work. 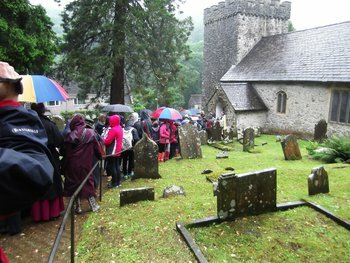 Thank you to all the schools who have been involved in the pilgrimage and especially to the pupils of Hafod, Penllergaer, Catwg and Llanrhidian Primary Schools who drew delightful illustrations for the pilgrimage book ‘Sharing the Light’. 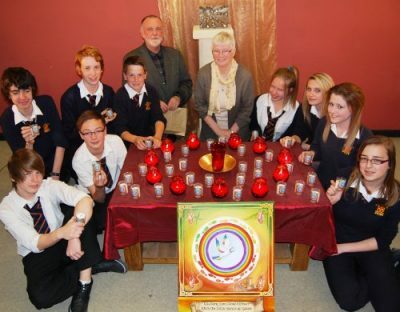 Thank you to Sr Anne Reddington RSM who made the beautiful pilgrimage mandala which also became the cover of the book, and to Mr Ricky Perrott and the pupils of St John Lloyd Catholic Comprehensive School Llanelli who supplied all the peace votives. 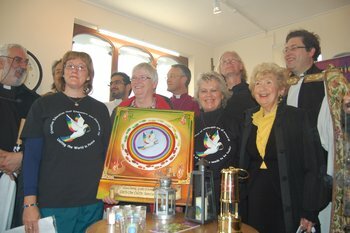 Thank you to Caroline Buckler and the volunteers at The Lamplighter Bishopston where our pilgrimage began and to The World Peace Flame, The Solas Bhride Community, The Sisters of the Society of the Sacred Cross at Ty Mawr Convent Monmouth, and Vivien Snow of the West Vale Catholic Community. 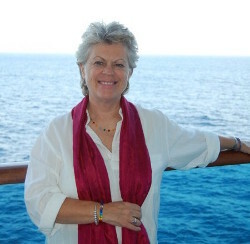 Special thanks go to my friend and former teaching colleague S Marlene Thomas who kindly translated the pilgrimage prayer into Cymraeg, to my friend Thomas Corum Caldas who translated the prayer into Irish Gaelic, to Grace Birt who drew the lovely pilgrimage map, to Brian Pugh for sharing his fascinating stories about Saint Peter’s well and ruins, and to Dalleen Jones who explored Gower with me and took wonderful photos for the pilgrimage book. Last by not least, thank you for the support given by The Lord Mayor of the City and County of Swansea, Cllr Dennis James, and to the Chief Superintendent and Regional Commander of Police, Mark Mathias. Thank you all for your valued friendship and support. You fill my heart with joy and hope for the future!